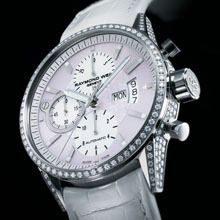 With modern women showing more and more interest in watchmaking technique, RAYMOND WEIL is delighted to unveil the latest jewel from its mechanical freelancer collection: a fresh, elegant date chronograph whose harmonious blend of original design and watchmaking skill is sure to enchant today’s women. Urban and contemporary, sober and elegant… this dazzling, amazingly zestful 2009 Ladies' chronograph is a startling new addition to the freelancer collection. Perfectly blending originality with mechanical sophistication, the new model displays all the aesthetic and technical qualities for which the collection is famed. 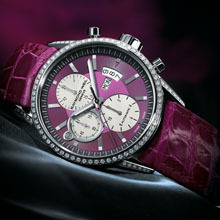 The functions of this new, exceptional watchmaking jewel are clad in delicate, ultra-feminine tones. With their delightfully original colors, the subdials (12 hours at 6 o'clock, 30 minutes at 12 o'clock and 60 seconds 9 o'clock) offer the last word in feminine refinement. The central chronograph hand, and the day- and date-windows at 3 o'clock, complete the innovative dial in great style. The circular bezel and the brushed/polished 42mm steel case are both studded with diamonds, carefully chosen for their purity and further underlining the exclusive appeal of this Spring-fresh timepiece. Who could resist the sparkle of 86 or 235 diamonds – depending on the model – twinkling irresistibly against the dial's shimmering colors? A final touch of class is the full-skin crocodile strap with saddle-stitching that matches the glamorous tones of each model, and fits snuggly to the wrist thanks to its folding clasp with double push-piece security. 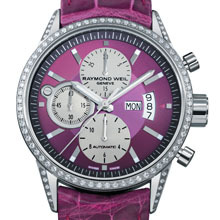 RAYMOND WEIL watches are renowned for their perfect balance between technique and design – and the Geneva watchmaker has paid meticulous attention to the aesthetic appeal of the freelancer collection's first Ladies' chronograph, while again giving full rein to its outstanding watchmaking savoir-faire. Beneath the multi-toned dial, and protected by a sapphire crystal with double-sided anti-glare treatment, the heart of the self-winding mechanical movement oscillates at a frequency of 28,800 vibrations per hour. Two characteristic push-pieces activate the chronograph functions: start, stop and re-start at 2 o'clock; reset function at 4 o'clock.